Missionaries from Argentina to E Europe, they have been our inroad into the nation. Danny's vision was to unify and reconcile the different denominational and ethnic factions within the body of Christ, therein we found a kindred spirit. 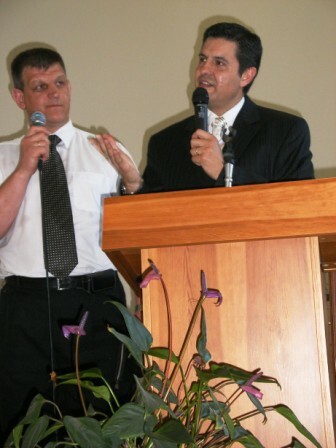 They also were our catalysts for Argentina and as a result, the pastors and leaders conferences came about in April 2003. These continued for six years. Danny has a teaching gift and for several years lectured in the Jelgava Bible School. He and Damaris handed over their leadership roles overseeing the Russian church in Liepaja - Emmanuel - on the western Baltic coast. There is now in place the first joint ministry team - Russian & Latvian - into Emmanuel's leadership. This is what we aspire to achieve, encouraging and facilitating indigenous church leadership. After some years of closure, the national Bible School at which the Pedraza's once taught, has been reopened and re-launched as the BALTIC SCHOOL OF MINISTRY. In 2009 Danny was asked to become the principal and accepted. Colin was asked to become a board member and he also accepted. This is an exciting time and a long awaited dream realised for the Pedraza's as well as ourselves. The school is located in a village near the city of Jelgava; September 2013 will see the commencement of our fifth year. Past students are serving in many areas both geographical and ministry: church youth ministry, overseas internships, further Bible studies overseas and overseas church planting leadership.